Samsung’s new phone series with dew-drop notch the Galaxy M20 and Galaxy M10 was launched recently and it went on sale through online shopping platform Amazon India and the Samsung e-shop. And after the opening minutes of the sale the phone went out of stock. 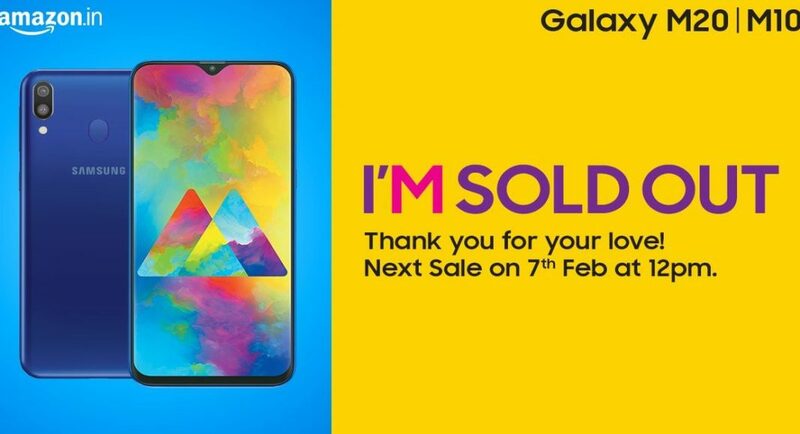 So, filling the stocks and pushing more smartphones out to the users, Samsung will launch a second batch of the M series which will go on sale on 7th of February. The sale will be live on both Amazon India and Samsung e-shop. How many units does the second batch holds its not disclosed by the company, so those who want to get their hands on the M series should stay alert of the upcoming sale. Samsung Galaxy M series was launched last week with two smartphones, the Galaxy M20 and the Galaxy M10. With the M series phones Samsung has adopted the online-only sales technique for the first time. And according to the company the M-series is targeted towards the young generation. These phones will sell on Amazon.in along with Samsung’s official e-shop. Amazon India is also giving Total Damage Protection for the Galaxy M10 at Rs 699 and Rs 1,199 for Galaxy M20 along with no cost EMI for the latter for a duration of 6 months. The Jio Galaxy Club offer is also available on both Amazon.in and Samsung e-shop. And it will grant the customers benefits worth Rs 3,110 to Jio subscribers in the form of additional data on the Rs 198 and Rs 299 prepaid plans with the purchase of the Galaxy M10 or the Galaxy M20. The Samsung Galaxy M20 is priced at Rs 10,990 for the 3GB RAM + 32GB storage model while the 4GB RAM and 64GB storage variant is priced at Rs 12,990. Similarly, Samsung Galaxy M10 is priced at Rs 7,990 for the 2GB RAM + 16GB storage variant while the variant with 3GB RAM + 32GB of internal storage sales for Rs 8,990. Talking about the Specs, the Galaxy M20 comes with dual Nano SIMs and it has Samsung Experience 9.5 UX based on Android 8.1 Oreo. It features a 6.3-inch full-HD+ (1080×2340 pixels) Infinity-V Display with a 19.5:9 aspect ratio. It is powered by Exynos 7904 SoC with up to 4GB of RAM. It has dual rear camera setup comprising of a 13MP primary sensor and a 5MP ultra-wide sensor. The front camera is an 8MP sensor for taking selfies. The M20 has up to 64GB of internal storage with an option for expandable storage card up to 512GB. It has a huge 5,000mAh battery which can offer more than one day of usage. The phone offers a USB Type-C port which comes with fast charging, it also comes with a rear facing fingerprint sensor and a face unlock feature. Similarly, the smaller Samsung Galaxy M10 also has a dual Nano SIM card slot and it runs Samsung Experience 9.5 UX based on Android 8.1 Oreo. It comes with a 6.2-inch HD+ (720×1520 pixels) Infinity-V Display that has a 19:9 aspect ratio. The Galaxy M10 is powered by an Exynos 7870 SoC along with 2GB or 3GB of RAM. It too has a dual rear camera setup on the back with a 13MP primary sensor and a 5MP secondary sensor. The front camera is a 5MP sensor for selfies. The M10 has up to 32GB of storage with option to expand more up to 512GB with a microSD card. There is a 3,400mAh battery backing it up which supports fast charging.